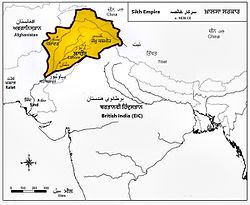 During the early years of the nineteenth century, the Sikh kingdom of Punjab was expanded and consolidated by Maharajah Ranjit Singh. Ranjit Singh was proclaimed as Maharaja of the Punjab on 12 April 1801 (to coincide with Vaisakhi), creating a unified political state. It was the last major region of the subcontinent to be conquered by the British. After the death of Ranjit Singh, the empire was weakened by internal divisions and political mismanagement. Finally, by 1849 the state was dissolved after the defeat in the Anglo-Sikh wars. The military force of Sikh empire is known as Khalsa. The military system of Ranjit Singh combined the best of both old and new ideas. He strengthened the infantry and the artillery. First Anglo-Sikh war was fought between Sikh Empire and East India Company. In this battle, East India Company was led by Sir Hugh Gough and Henry Hardinge and Sikh army was led by Lal Singh. The Sikhs were completely defeated, making this the decisive battle of the First Anglo-Sikh War. After the annexation of Punjab, it became the North-West Frontier Province, by the East India Company.